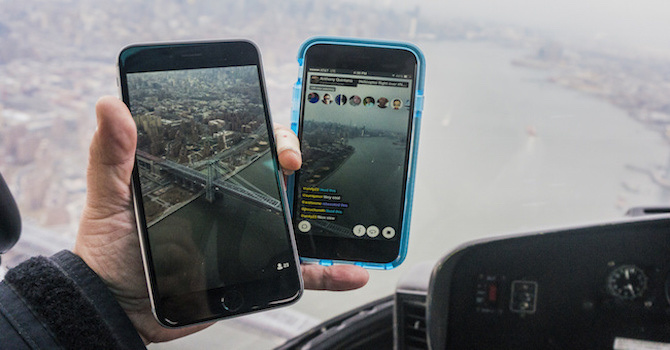 Two hot new apps: Meerkat and Periscope. Meerkat took over SXSW and caused a stir at the demo day of famed startup accelerator Y Combinator before the Twitter-backed Periscope launched a few weeks later and stole some of its thunder. Both have succeeded by (1) focusing on the casual individual users that established live video tools like Ustream and Livestream have moved away from and (2) going to where the digital tastemakers live by launching their apps on iOS and fully integrating the experience with Twitter. The first is a more exciting development from the perspective of citizen witnessing, but overall it is exciting to think about how the spread and ease of live and interactive video could make human rights video more effective. It’s a line of thinking we’ve talked about using the term “copresence,” which you can read more about here. lot of other projects taking live and constant video in different directions. Rhinobird is another live effort that is approaching live video in a more collaborative manner, embracing an open source framework with features that allow for remixing, curation, and activism uses. The project is headed by Berkman Center fellow Felipe Heusser. This month our friend Nathan Freitas at the Guardian Project highlighted his excitement about it in the context of the current live video hype. And for the Android users out there jealous of the two shiny new iOS apps, Stre.am is a similar tool that has been around in beta for a while and finally launched at SXSW a few weeks ago. Parallel to the trend of live video, there are growing conversations around the use of always-on video. On the consumer side there are apps like Alibi, which when turned on, runs in the background of your phone and lets you save the last hour of video/audio/location data at any point. It’s a beautiful app that passed 1000 downloads this month and kicks up a ton of questions about how “always-on” video could be used for accountability or human rights documentation. However, there are also many questions about how it could be used in less righteous ways (that said the most widely embraced innovation could actually end up being their work on optimizing battery life while shooting continuous video in the background, as they’ve got it running on just about 1.2 times the juice of normal phone use). One use case that is of specific interest to the Alibi team is how the app can be used to film interactions with the police. This is interesting to think about in conjunction with the developments around the most talked-about use of constant video lately: police bodycams. The proposals and demands for the increased use of bodycams in America have continued to grow since they began last fall. Now, police departments are starting to grapple with the implications of having always-on video used by their officers. In Seattle, for example, police are releasing all of their bodycam footage in a blurred and soundless format on YouTube, hoping to satisfy overwhelming open records requests. Other cities have backed off implementing bodycams due to concerns about how to manage access and privacy. Data & Society, a think tank based in New York, recently released a report that gives a good overview of the experiences so far. This post is part of our monthly look at the tech behind video activism; see previous posts here. Featured image courtesy of Anthony Quintano. Image has been slightly modified. Morgan Hargrave focuses on technology and human rights at WITNESS. You can follow him on Twitter @MorganHargrave.